If you have a retail business it goes without saying that your retail window displays are vitally important. Great window dressing is an excellent opportunity to bring customers into your store, attract passing trade and make sales. But cluttered, stale or badly orgainised retail displays are liable to do the exact opposite and turn those potential customers away. FOCUS on your window dressing and attract more customers. Window displays, are a part of visual merchandising, and are often neglected by the small business owner. This can be due to a lack of focus or a lack of time. Yet good retail window displays aren’t difficult and needn’t be time consuming. Window displays are used to interest potential customers and bring them inside your store. Everything you do must focus on attracting that customer into your store, where your chances of achieving a sale increase enormously. Throughout the year there are different seasonal or popular goods that are in demand. So these themes can cater for Mothers and Fathers days, back to school, graduation, spring or sales displays. Make the most of these themes; decorate your windows to show your themed products and attract those customers. A cluttered window display is not appealing, but any display should show the range of products that you sell. You need to get this balance right. If for example you sell household wares, you can’t show one of everything in your window, but you should show some plastic, some ceramic and some stainless steel products to let people know that you carry a full range of household goods. If your space is limited use colour, lighting and motion to attract the eye, not just to your window displays, but also to the inside of the store. Remember that the less window space you have, the more often you should change your retail displays. A brilliant window display that never changes is as good as no display when it comes to attracting customers. On the purely physical side, goods exposed for too long in a window fade in colour and are damaged by exposure to sunlight. Window displays need to be changed before they start looking faded and tired. In fact displays should be changed far more frequently than that and are best based on how often your regular customers visit your shop. Present them with an interesting and fresh window display often and impulse buying will increase. Your shop window is your brand. What and how you decorate and lay out your merchandise in your store window should tie in with your image. If for example you are a tool merchant, you should not decorate your window in the same way a ladies boutique owner would. Try and make your display unique, make yourself different. Display goods that are not found elsewhere. Make your logo stand out. Remember, tired and faded window displays give a poor impression of your whole store. SALE … Do you advertise in your window displays? SALE … That word attracts customers who tell friends and family, yet many small business owners never hold sales. Large chain stores are always selling something as a special or sale item. ; every week of the year, every day of the week and you should too. Sale items in window displays attract customers. Use your window dressing to announce specials and sale items. Use seasonal and holiday sales to pull potential customers into your store. SALES attract and the news spreads, so advertise them. Where’s the entrance? Small stores often have small doors. Why? Small doors are barriers to customers entering your store, so remove them. Open up your windows to show the interior of your shop. Allow your potential customers to see inside and invite them inside by removing anything that makes the entrance feel like a barrier. Who does your window dressing? 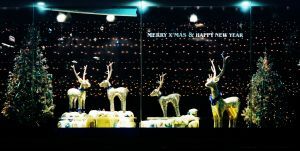 If you have a large business with retail window displays in many high streets or shopping malls, then a professional window dresser is a must. If you’re a small business owner, then DIY is your answer. Manage your window displays yourself or find a talented staff member with the flair to do it for you. FOCUS on your window displays, and remember they are there to attract customers, so go outside and look in often. Ask yourself if you are attracted by them. Ask yourself if they look fresh. Are they vibrant colorful and interesting. And; ask yourself, if you are proud of the image they project, of your business.